The last couple of days have been bizarre, to say the least. If you found Ravenous Fig via Hacker News, you know what I mean. If not, there's a pretty fantastic recipe in here for you that will hopefully make up for lost time. Let's rewind. For my birthday last month, Vance took me to Atlanta to visit some friends who just had the most adorable baby boy. Seriously. He makes the Gerber baby look like an elephant calf with angler fish teeth. We stayed at a sweet bed & breakfast in Midtown, which was a great comfort considering how sick I'd get before we left. These flu-like symptoms kind of snuck up on me. I tried to pretend it wasn't happening and power through, but by the last night I was sitting in the bottom of the bathtub letting the hot water beat on my back as I coughed up Lord-knows-what. Not the best way to spend a vacation, but I got some good magazine time in while I was holed up in the room, specifically with La Cucina Italiana. That magazine has the most beautiful food photography. It almost made me want to throw away my camera and never publicly post a food photo again. It somehow entered into my ill consciousness, though, giving me dreams of gnocchi with rich sauce and melted kale. Soon after I got back to Orlando and over my illness, I had pieced together a meal I could only imagine would taste like magic. This recipe may have been the result of psychedelic flu dreams but believe me, it's worth the hour or so it takes to prepare. After having prepared and eaten it twice, it's one that'll definitely make an appearance in this year's family cookbook. Enjoy. Special Equipment Needed: Food processor. * I substituted unsalted shelled pistachios when I made this the second time, and nobody knew the difference. Start by roasting your tomato. Preheat your oven to 400°F. Place cored tomato on a baking sheet with tinfoil and roast for 30 minutes. While the tomato is roasting, prepare the clarified butter. Place the butter in a heavy saucepan and melt slowly over low heat. Remove the pan from the heat and let stand for 5 minutes. Skim the foam from the top, and slowly pour into a container, discarding the milky solids in the bottom of pan. Prepare kale, red onion and garlic according to the instructions in the ingredients list, above. Heat oil in heavy frying pan over medium-high heat until it's shimmering. Add onion and saute 3-4 minutes until it starts to brown. When onion is turning slightly brown, add garlic and saute 1 minute more. Add chopped kale leaves to the browned onion/garlic mixture, season generously with salt and fresh ground black pepper, and let the kale wilt for 2-3 minutes, then add 1/2 cup water, stir, and let the kale cook in the water until the pan is almost dry, about 5-10 minutes. 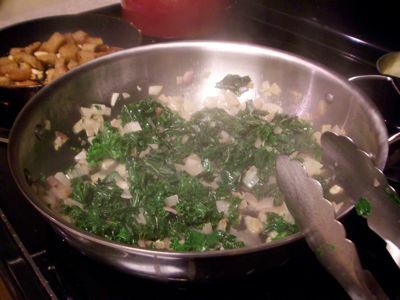 As the kale cooks and you start on your romesco, remember to add about 1/2 cup of water every time the pan starts to look dry. 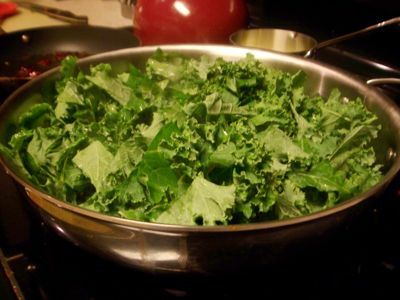 This will take 10-20 minutes depending on your taste in kale. 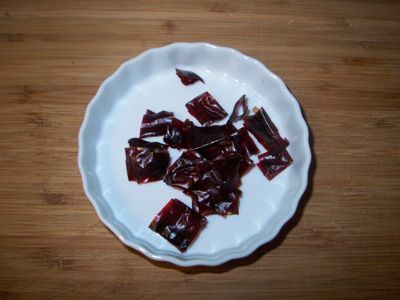 Slit chile open lengthwise and discard stem and seeds, then chop or tear into 1/2-inch pieces. Heat 1/3 cup oil in an 8- to 10-inch heavy skillet over moderately high heat. Add chile and cook, stirring, for 30 seconds to one minute. Transfer chile to a heatproof bowl with a slotted spoon. Add nuts, bread, sliced garlic and red pepper flakes to the oil and cook, stirring, until bread is a light golden brown. Transfer the mixture (including oil) into the heatproof bowl with the chile. Peel and coarsely chop your roasted tomato, taking care not to lose too much of the juice. 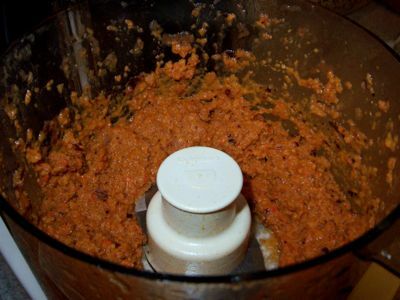 Transfer the chopped tomato with its juice to a food processor. Add the bread/chile mixture, jarred roasted red pepper, vinegar, and 1/4 teaspoon of salt. Purée until smooth. Thin with water, if desired, and season to taste. To make the crispy gnocchi, simply warm clarified butter in a small to medium skillet. Add gnocchi and cook, stirring, until fragrant and golden brown (about 2-3 minutes). If you're not sure whether the gnocchi is done, taste one (after letting it cool a bit)! 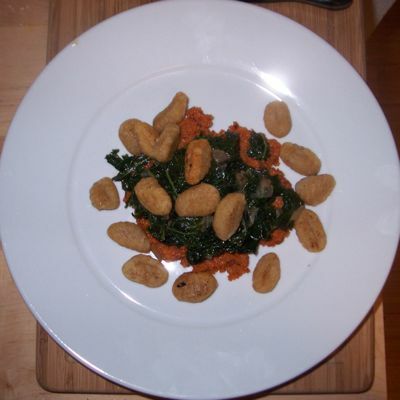 To serve, place a layer of romesco sauce (about 3/4 cup) onto a plate. Top with a scoop of the melted kale and a handful of crispy gnocchi.